Welcome to Paul's Emu Place! I'm tearing the site apart and rebuilding. Stuff is broken. Not everything works. Yet. Here is a picture of Eve. I was in the pen with the camera and snapped this shot as she was coming for a peck at the "thing" I was holding. The auto-focus on my Polaroid does strangely neat things. I'm glad you stopped by! 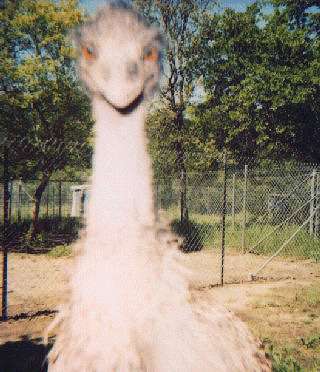 I raise emu on my ranch near Burnet, Texas. Twenty-five acres may not be a big ranch, but LostCreek Ranch keeps me busy. I had 14 -pair- that have laid. They laid 80+ eggs. But that was a few years ago. Now I have three pair and maybe twenty eggs this season. Since May, 1997, you are visitor if this counter is actually working.